Legend: True-colour composite from the MODIS instrument on NASA’s Terra satellite and SMOS surface wind speed amplitude of hurricanes Kilo (left), Ignacio (centre) and Jimena (right) on 29 August 2015. All three were category-4 hurricanes and spanned the central and eastern Pacific basins. The bright bands in the images are sunglint where solar radiation from the Sun has reflected from Earth back to the satellite sensor. This year sees a strong El Niño event which causes much higher temperatures than normal in the upper layers of the Tropical East Pacific. The available surplus heat favors an increased occurrence of Tropical Cyclones and storms. According to the National Oceanic and Atmospheric Administration (NOAA), this season has been ranked as the fifth most active hurricane season within the Eastern Pacific since 1971. In a normal season, the average number of Major Hurricanes (Category 3 and plus in the Saffir-Simpson scale) is expected to be 3 whereas this year already 8 Major Hurricanes have occurred. At the end of August, three Category 4 hurricanes (named Kilo, Ignacio and Jimena) developed in parallel in the vicinity of Hawaii which MODIS and SMOS sensors were well able to capture. Several types of satellites observations are available to characterize surface winds over the ocean such as active scatterometer radars and passive low-frequency radiometers operating in C and L-band. The advantage of using such radiometers, being an all-weather tool, lies in detecting extreme wind speed (above 33 m/s, i.e., hurricane force) which scatterometers are not able to detect. Three such radiometers, namely, the ESA/SMOS and the recently launched NASA/SMAP L-band and the JAXA/AMSR-2 C-band, are now available to provide such observations. SMOS surface Tbs and wind speed products along SMOS swaths were determined using the algorithm of Reul et al., 2012 and updated in Reul et al., 2015. Image Reconstruction based on JRECON (J. Tenerelli, 2011). SMOS Level 1b Tbs are retrieved at antenna level and are further corrected for extra-terrestrial sources contributions, smooth sea surface emission, and atmospheric path effetcs to estimate a storm-surface induced Tb residual. A Quadratic Wind speed GMF is applied to the First Stokes parameter residual to obtain U, the surface wind speed. Current validation reveals an rms of ~5 m/s up to 50 m/s with respect SFMR flight data or H*Wind analysis at the same spatial resolution than SMOS. AMSR-2 surface winds are obtained using the Algorithm developed by Zabolotskikh et al. (2013, 2015a,b) which involves the combined used of highest frequency Chanels (for rain retrieval) and atmosphere corrected 6.925 and 7.3 GHz channels for surface wind inversion. Thanks to the density of observations available from these 3 missions, the evolution of surface wind speed under tropical storms can now be monitored with an unprecedented spatial and temporal resolution. The example of the 3 co-evolving hurricanes in the East Pacific demonstrate this capability with an ensemble of 121 satellite swath intercepts of the 3 storms obtained by combining the data from the 3 sensors over a period of about 15 days (22 Aug to 7 Sep). The below animation shows the time-series mosaic of surface wind speed measurements under Hurricanes Kilo, Ignacio and Jimena. Data from the three satellite microwave radiometer missions: ESA’s L-band SMOS, NASA’s L-band SMAP and Japan’s C-band AMSR-2 are combined to reveal the track of each hurricane and maximum wind speed measured by each sensor at the ocean surface during the period. Click on the link above to see the time series. 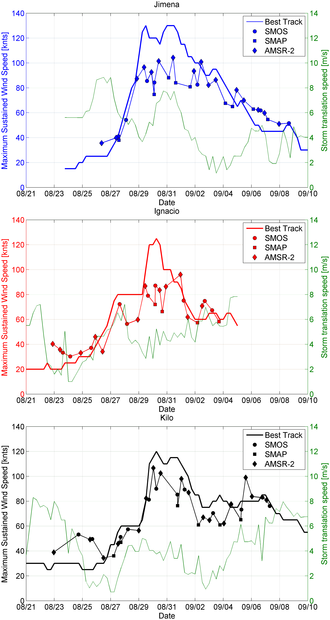 Caption: Contours of the domains showing the maxima of surface winds obtained from the combined multiple observations of SMOS, SMAP and AMSR-2 sensors from 22 Aug to 9 Sep 2015 showing the high wind trails over Hurricanes Kilo and Loke (left), Ignacio (center), Jimena (right). Comparison of the Maxima of winds from the 3 satellites with Best-Track Maximum winds is shown here below. Caption: Time series of the Maximum Sustained wind speed as provided by TC's center (NOAA/HRD and NHC) together with the Maximum wind estimated from SMOS, SMAP and AMSR-2 fro Jimena (top), Ignacio (middle) and Kilo (bottom). As revealed, the results show a clear capability to measure the maxima of Surface winds up to 90 knots (=up to Category 2) . Estimates from the three sensors are very consistent in between themselves and with the Best-track observations and one obtain a regular and frequent temporal coverage thanks to the combination of their data. Limitations in the highest wind domains is not due to Tb saturation but to the 30-40 km spatial resolution smoothing effect (Highest-wind generally occur in a narrow region of radius < ~100km around the eyes with very high Wind speed radial gradients). Key characteristics of hurricanes, such as the radii of wind speeds above a certain threshold (i.e. 34, 50, 64 and 84 knots), can now be captured more often in far more detail. This will greatly improve the representation of initial conditions of Tropical Cyclones in Numerical Weather forecasting systems and hence their prediction. Caption: Sea Surface Temperature anomalies (in degrees Celcius) reveal cold-water wakes trailing behind hurricanes Kilo, Ignacio, and Jimena highlighting the power of hurricane winds to violently stir the upper ocean and bring cooler waters at depth to the ocean surface. Reul, N., J. Tenerelli, B. Chapron, D. Vandemark, Y. Quilfen, and Y. Kerr (2012), SMOS satellite L-band radiometer: A new capability for ocean surface remote sensing in hurricanes, J. Geophys. Res., 117, C02006, doi:10.1029/2011JC007474. years SMOS-storm database, submitted to Remote Sensing of Environment, 2015. E. V. Zabolotskikh, L. M. Mitnik, and B. Chapron, “New approach for severe marine weather study using satellite passive microwave sensing,” Geophys. Res. Lett., vol. 40, no. 13, pp. 3347–3350, 2013. E. Zabolotskikh, L. Mitnik, N. Reul, and B. Chapron, “New Possibilities for Geophysical Parameter Retrievals Opened by GCOM-W1 AMSR2,” IEEE J. Sel. Top. Appl. Earth Obs. Remote Sens., vol. PP, no. 99, pp. 1–14, 2015a. E. Zabolotskikh, N. Reul and B. Chapron, “Geophysical model function for the AMSR2 C- band wind excess emissivity at at high winds“, submitted to GRSL, 2015b.